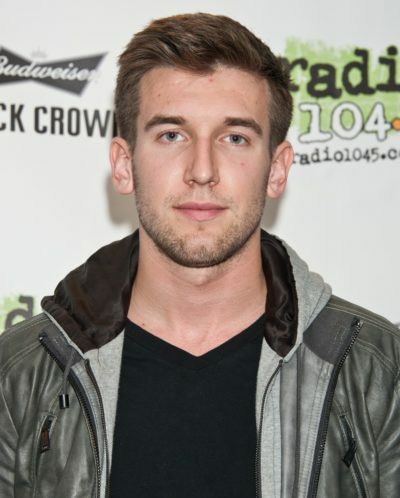 Max Frost is an American singer and songwriter. He is the son of Lucy Elizabeth (Nickerson) and Michael Anthony “Mike Terri” Frost. Max’s patrilineal ancestry can be traced back to his eighth great-grandfather, George Frost, who was an English immigrant. Max’s paternal grandfather was Jean DeAtley “J.D.” Frost (the son of Isaac Newton Frost and Mary Agnes DeAtley). Isaac was the son of Wilson Frost and Margaret “Maggie” Byrn. Mary Agnes was the daughter of John A. “Jack” DeAtley and Eva L. Smith. Max’s paternal grandmother is Anna Warren Proctor (the daughter of Warren Christopher Columbus Proctor and Avie Stella James). Warren was the son of Thomas Frazier Proctor and Anna Melinda Haddock. Avie was the daughter of Leslie Christopher James and Orena Belle Malone. Max’s maternal grandfather is David Samuel Nickerson (the son of Millard Gronly Nickerson and Edith Lois Mitchell). Millard was the son of Samuel Nickerson and Emma Rosalina Gravel. Edith was the daughter of Canadian immigrants, Frédéric Dumouchel (later Frederick “Fred” Mitchell), of Thurso, Québec, and of Sarah Emma Riley, whose parents were English immigrants. Max’s maternal grandmother was Dorothy Katherine “Kathy” Clark (the daughter of Edwin Milligan Clark and Dora Elizabeth Martin). Edwin was the son of Lewis Gibson Clark and Ida May Rankin. Dora was born in Bhera, Punjab, British Raj (now Pakistan); the daughter of John Howard Martin and Elizabeth Jane Gregory. Max’s matrilineal ancestry can be traced back to his fifth great-grandmother, Margaret Miller (died December 16, 1838, Rich Hill Township, Muskingum County, Ohio). There’s no reason to believe that the user Manila invented the Native American ancestry of Max Frost, but it was better if he/she added a genealogy to prove it. Waiting for a Manila’s reply. Who were his Native ancestors? I’m not a psychic. I don’t even get ESPN on TV. You don’t want to add the Native American ancestors that Andrew finds, but you leave newly submitted celebrities with native ancestors unedited… Many of them are equally unverified. Among the sources here, only one is a genealogy, and it doesn’t show any native ancestors. It’s shouldn’t be kept this way. I assume you don’t care because he’s not very famous, but it should still be removed. Maybe someone shuld look through all people listed as part Native American to see if their ancestors are in fact verified. I also have no idea why someone would waste time looking for, and talking about, 1/2096 of someone’s ancestry, often unverified, but I’m not coming along for the ride. I don’t understand it either. But not finding an existing native ancestor is less significant than finding and listing an unverified one. The reason it matters is that people care about it more than about European ethnicities. Like you, I don’t have the energy, nor time, to do that. Who are Suzanne Malveaux’s First Nations’ ancestors? It was on the show. I don’t exactly get why follers was sceptical about the Native American ancestry of Chris Cooper (that isn’t that distant) and Patrick Dempsey, or perhaps she’s busy in other plans atm. It’ hard to get datas/records before 1850, but both have ancestors who evidently had Native American ancestry. When I need to spend more than a few seconds looking into 1/128th or so of someone’s ancestry, I tend to tune out pretty quickly, unless it’s Taylor Lautner or Johnny Depp or a special case like that. That’s about why. Didn’t Chris Cooper’s ancestors get rejected in their application to be listed as Native American? Quote: Didn’t Chris Cooper’s ancestors get rejected in their application to be listed as Native American? What does that page say?